I once flew United Express out of Denver and there was no soap in the lavatory. I couldn’t stop thinking about this every time I saw passengers use the lavatory, including spending 10 minutes at a time in there. Although I suppose that’s better than the American flight to Chicago that took off without a working lavatory at all. If a lavatory stinks, stick used coffee grounds in there. And whatever else, wash your hands. I try to use a paper towel to open the lavatory door after washing my hands, or else I’d defeat the purpose of having washed in the first place. American Airlines by the way uses C.O. Bigelow soap in its lavs, while some passengers report that Ryanair may save money by not bothering to refill the soap in its lavs. New low for @Ryanair? No soap in toilet, reported to staff, reply: "we don't have soap on this flight"!!! Not everyone is having the denial, however. Ryanair would do well to apologise for soap-gate, fix the problem & move on, rather than accusing me & others of lying – why would we?! Whenever Ryanair has been out of the news for awhile Chairman Michael O’Leary will threaten to make passengers fly standing up and pay to use the toilets. They once suggested passenger gambling onboard would replace ticket prices. These aren’t ever going to happen, but it gets news coverage and it reinforces the idea in consumer minds that Ryanair is cheap — that if you want cheap flights go to Ryanair. Here though it’s not the airline claiming to be cutting perks, it’s passenger reports and cabin crew statements that are driving the coverage. And frankly I expect a more creative response from Ryanair than just ‘it isn’t true’. Airlines should provide hand sanitizer as well as soap. I imagine a good portion of the public would prefer using sanitizer over washing. Less hand washing means less water usage and less weight. That would save money and create a healthier onboard environment. 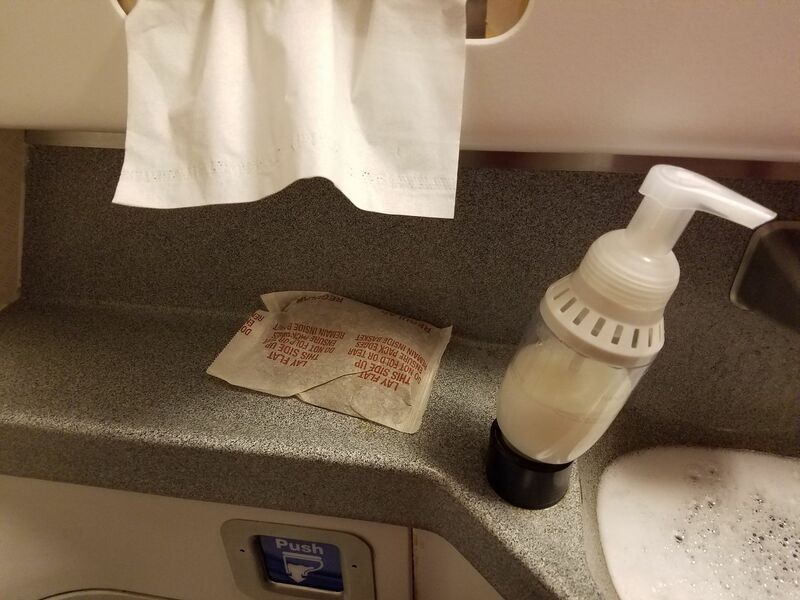 If AA wanted to demonstrate a commitment to diversity, it would put hand lotion in lavs in planes like it does in clubs, at least in B and F class. (On international flights just providing amenity kits is not good enough.) Washing properly with soap and water combined with the arid conditions onboard results in horribly dry skin and the ashy condition that afflicts Blacks. That’s not worthy of concern for AA. .
Hand Sanitizer? No thank you! This story has some traction because everyone thinks Ryanair is ridiculously cheap. They may be, but that doesn’t mean the allegations are true. For some reason, that Ryanair flight had no soap. Mistakes happen. But I’m 99% certain that it is not Ryanair’s policy to eliminate lavatory soap. Aside from being gross, it probably violates some sanitary law. And what’s the cost of soap? Talk about de minimis — it’s probably hard to find a lower expense on Ryanair’s books. For some reason, social media seems to create stories out of every petty mishap. If I go to McDonalds today and I accidentally get one pickle instead of two, will there be a story about McDonalds “cheaping out” on pickles? Hi Gary. Which “heads” do you wash in the lav? Both the big head and the small head? Who washes their head in an airplane toilet? …………I guess nobody anymore on Ryanair. In my opinion the perceived health concerns of gels are not as serious with ethyl alcohol based gels. I did study this as part of my professional training and I am willing to venture the gels as used are more effective than limited hand washing and drying in an aircraft lav. Washing your hands in an aircreft lav and then using the damp towel to open the door is not a perfect strategy. I’d believe near anything about American Airlines. Unless it was something good. So, where do the flight attendants wash their hands? Or do they not return to work when they leave the lav? These are serious questions because I have run into this problem myself, and the fact that it has happened to others means that it may be more common than we realize. Isn’t it kind of a simple problem: Plane doesn’t depart until the lav is a functional lav, just like it doesn’t depart before the pilot goes through his checklist. I guess we should all start leaving a small bar of Holiday Inn soap in our carry on’s just in case. Most airlines are just adding water to the soap dispenser to keep it full. Next time you fly look at the soap dispenser and tell me I doesn’t look watered down. I know many airlines are guilty of this bc I notice it all the time.